Update: Asus ZenWatch 2 Android Wear 2.0 now available for download for both smaller 1.45 inch as well as the bigger 1.6 inch smartwatches. Download and flash OTA now. Following the stunning Asus ZenWatch 3, the Android Wear 2.0 official OTA update is rolling out for the ZenWatch 2 starting the variant WI501Q (sparrow). The OTA zip file for the other variants WI502Q (wren) shall be available for download later today. The firmware build number for ASUS ZenWatch2 WI501Q is NWD1.170706.001 that comes with the OTA package. Plus, the Android Wear 2.0 is sure based on the latest 7.1.1 Nougat AOSP sources. Finally, the wait for AW 2.0 update for ZenWatch 2 is over. Unfortunately, not for everyone. The smaller Zenwatch 2 OTA update is still holding back. As it comes to the bigger WI501Q variant device, we shall soon see the Android Wear 2.0 rolling out for WI502Q. You may go to Settings > System Updates > and Check for OTA updates. If not, you can grab the OTA zip file directly from Android repository below and flash it manually via stock recovery. Not much is known about the stability of the firmware for ZenWatch 2 either. Users running Android Wear 2.0 on ZenWatch 3 have been facing some problems with WiFi and a little stability issue. How to Install Android Wear 2.0 OTA update onto Asus ZenWatch 2 via ADB sideload method? This is a manual method to flash OTA updates onto any Android device. This includes Android smartphones, tablets, wearable technology, smartwatches, Android Auto, and much more. For this method, then you will need the to connect your device to PC via USB cable. Your PC must have ADB and Fastboot setup. Go through the requirements and instructions carefully. 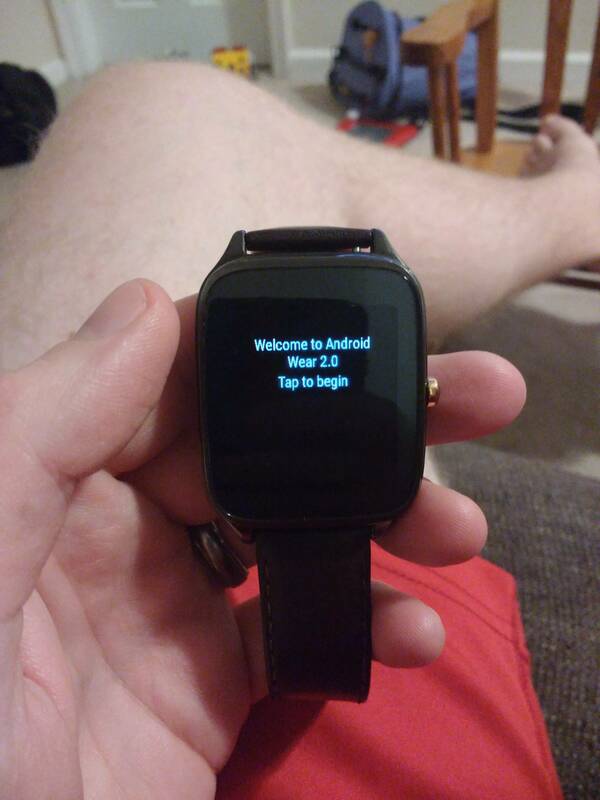 Step 1: Download the OTA file for Asus ZenWatch 2 from above. Place the file on your PC where you can easily locate it. Step 2: Make sure you have Enabled USB Debugging on your Android device from Developer Options found in Settings. Enable OEM Unlock if available. Trust the connection by allowing it when you connect it to your PC for the first time. Step 3: Make sure your PC has ADB and Fastboot environment setup. Step 4: Connect your Android device to PC via USB cable. Trust the connection by checking “Always allow from this computer” when you connect the device for the first time. Step 5: Keep the device plugged in and open a command prompt window or terminal on your PC where the file is located. Type cmd in the address bar and hit enter. In cmd, you can enter “adb start-server”. If not, proceed. Step 6: Reboot your Android device into stock recovery. To do so, issue the following command through cmd or terminal. Step 7: Once into the recovery, choose the option “Apply update from ADB” and swipe right on the smartwatch. Step 8: Now ADB sideload the OTA zip. Type the following command in terminal. Put the exact name into filename field and the exact extension. For instance, if the filename is ota.zip, then enter “adb sideload ota.zip”.